Very nice Estate find in excellent Antique condition. Primitive woven wood gathering/market basket with carved bent wood handles. Handles extend 6" above rim with total height of 14 1/2" to top of handles. Very nice Estate find in excellent Antique condition. 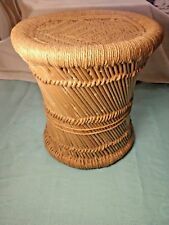 Primitive round woven wood gathering/market basket with carved bent wood handle. Nice tight weave with only one broken weave across two slats. The pics look worse than it is. Footed with markings on the bottom. Antique sterling silver basket by J S Co. Signed: J S Co. (hallmark) Sterling Y7HA. 117.3 grams. 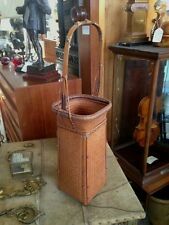 Fine Antique Handwoven Japanese Tall Basket with Handle. Excellent antique condition. Impressive master weaving techniques. See photos for details. To be perfectly honest, it was difficult to find information on this piece. It appears to be a hand-woven end table, but could be used for other purposes as well. The whole piece is quite sturdy, sturdy enough to sit on. Antique Victorian Bride's Basket. View all photos for closer inspection. And she is one cool and honest lady. TWO Bushel Baskets ! Made in USA. A nice old primitive. but i still think it is a nice old gathering or fruit basket. in very nice condition as the pictures show. darker decorations woven into the rim and handle too. from rare antiques to steampunk stuff. IT HAS 2 VERY SMALL PIECES WHICH I SHOW IN PHOTO 4 & 7. I HAVE COLLECTED OVER 48 YEARS BOTH HERE AND PENN. 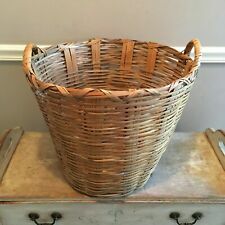 THIS BASKET IS VERY SIMILAR TO THE WISCONSIN INDIAN BASKETS. THIS IS A SPLINT MADE BASKET. When you view an item it is just as we received it. Not all countries are covered by this program so we apologize for any inconvenience this may cause. ONE 1/2 Bushel Baskets ! Made in USA. This basket has a lot of character! Inventory Number 7010. The basket is 14" x 6 1/2" x 8 1/4" wide. Good condition for its age. I will declare all major casting flaws that I find. I provide plenty of pictures for you to verify the condition. Pretty scrolls decorate each side and a deeper scoop is created, I believe, to make carrying the basket easier. Footed.Scalloped Edges. It could have been originally used to collect eggs from the chickens on their property. An antique primitive oak splint swing handle basket. You will not be disappointed. Antique Primitive Painted Oak Splint Basket. If weight is correct, we also use Standard Rates. we usually invoice within 4 hours of the end of sale. Primitive Folk Art Twig Basket Hand Woven Rustic Basket. Gorgeous hand woven folk art basket with a beautiful vine handle. 1 9" Wide X 9" Tall. You will receive actual item shown. 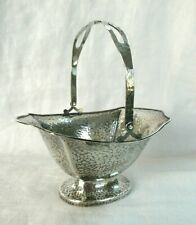 Vintage Silver Plated footed Basket Hinged Brass Handle Heavy Scalloped edge 7"
Monroe Johnson was a professional basket maker in Warren County Missouri in the late 19th and early 20th century. The author collected a large number of his baskets, and here describes them and points out how these unsigned baskets may be identified. Leather handles. 17" x 12" x 10.5" high. Antique 1909 Japanese Ikebana Woven Basket 9.75"
Prim HAND WOVEN & LASHED VINE BASKET w/ WOODEN BOTTOM~GREAT FOR FRUIT or EGGS! The maker of this primitive basket was (is?). very skilled; this is woven from 1/2"-5/8" thick vines, with the vine handles being covered by thin bark, and the lashing made of what looks to be a strong grass. As you can see from the pictures, this basket displays normal signs of age & use. This basket was heavily used in the field! I believe the nails were used to hold a cloth for preserving the berries. Perfect for primitive decor or a unique Easter basket. Unique shape with 9" tall handle making basket 14" tall overall (basket is 10" across top). Antique Sterling Silver Bon Bon Basket - Edwardian. Amazingly, the thin wood staves that form the woven wood staved plank bottom of the basket and that turn upward at the base and ascend upward as the sidewalls, are not cracked and don't have splits or loss. Georgian Antique Sterling Silver Sweetmeat Basket - Pre-1800. But they are not Shaker-like at all. They have very distinctive features. Swing handles are bentwood, and have a hole drilled at both ends to accept the "ear" which straddles both sides of the rim. Russian Silver Basket - Antique Circa 1900. Primitive Gathering Basket Handwoven Split Oak Splint PA Farm Estate. This is from a farm estate sale in Pennsylvania. Great antique condition, a little unraveling on bottom. Every thing appears to be in working order except for the robot who is missing the toes on one foot. Obviously they are used but should still have lots of life left for play or for the collector. Up for your consideration is a hand-tooled, hand-carved, primitive styled fruit basket made from a large pine tree limb. This marvelous fruit basket has been carved from a solid tree limb or log. This is a very difficult thing to do as no power tools were used in the making of this useful and decorative basket. BUY IT NOW THIS BEAUTIFUL ANTIQUE BENTWOOD. SPLINT HANDLE WOODEN HANDMADE BASKET. this basket is in very good pre-owned condition. WITH EMBOSSED LEAVE PATTER. 14" high bottom to top of handle. It has a drape flow ruffle look. The bowl is signed Thomas Webb & Son's on the underside of the bowl in a circle. The quadruple silverplated basket is maeked C.E. Barker Co, New York quadruple plate 521. This basket is in very good used condition. SEE PICTURES. This wonderful round basket has been in my collection for decades! No nails or glue, of course, just securely woven from what I believe is bamboo! In excellent condition and much finer than shown! Would make a fine gift!